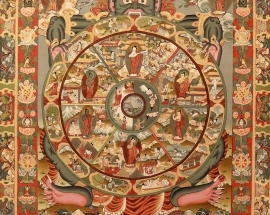 The Wheel of life (Sanskrit: bhava-chakra, Tibetan: srid pa’ikhor lo) painting is primarily a representation of the round rebirth and the various levels of sufferings within the round. 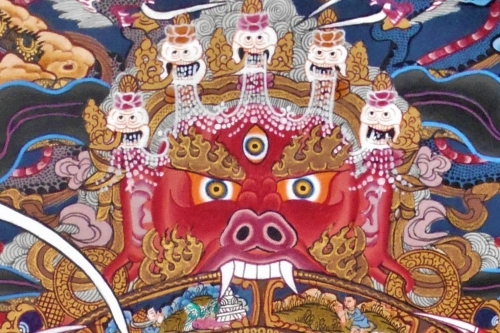 It is traditionally placed outside the sanctuary of a Buddhist temple, in a place where a person entering a temple will see it. 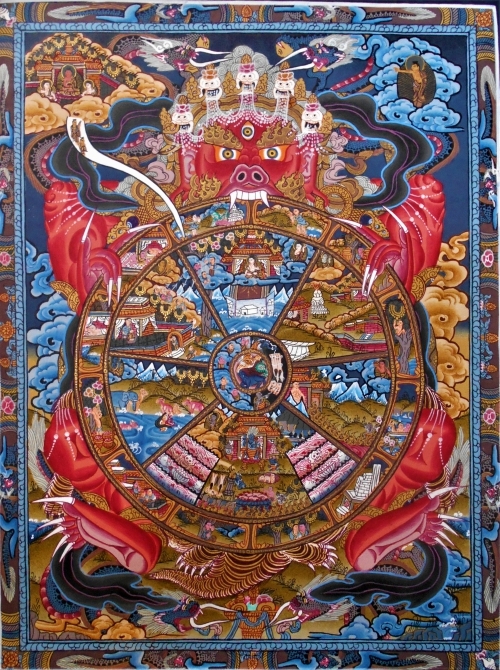 Thus the purpose of the Wheel of Life is to remind one of death and impermanence – that death is definite, the time of death is indefinite, and at the time of death nothing helps but religious practice. 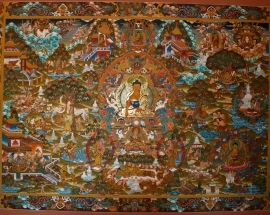 In this way, the Buddhist is inspired to make effort at religious practice now while the opportunity is still present. 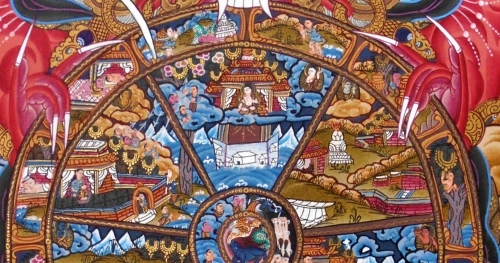 Found almost universally in the Buddhist temples of Tibet, Nepal, Bhutan, Sikkim and Mongolia, the earliest example of this painting that has been found is at the Ajanta caves, dating to perhaps as early as a century before Christ. 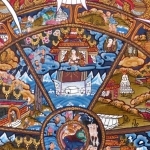 It is a marvelously informative and evocative work of art. 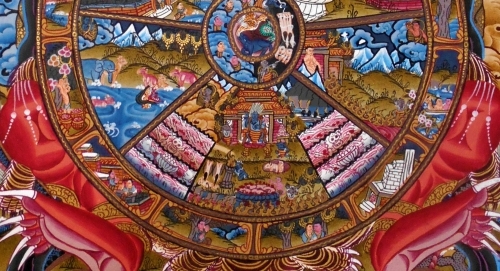 The story of the Wheel of Life painting is that Buddha himself designed it. 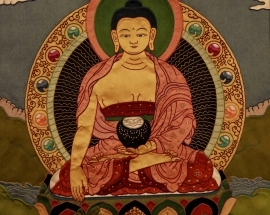 At the time of Shakyamuni Buddha, the historical Buddha, one King Udayana made a present of a jeweled robe to King Bimbisara, who was unable to present to King Udayana a gift of equal value. Undertaking this and leaving that. 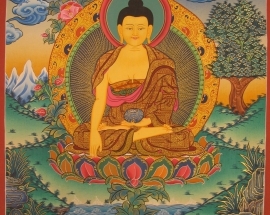 Enter into the teaching of the Buddha. Like an elephant in a thatched house. Destroy the forces of the Lord of death. 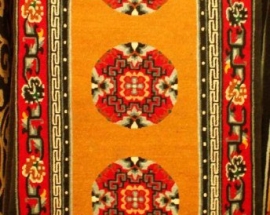 Those who with thorough consciousness. 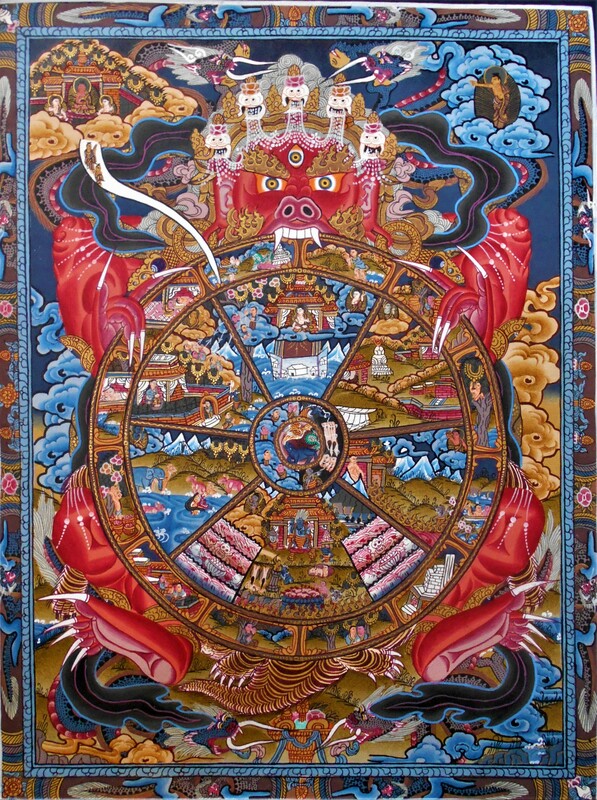 Will forsake the wheel of birth. Bringing suffering to an end. 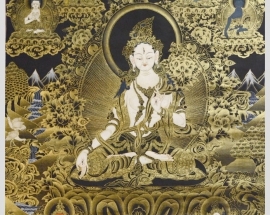 It is said that when the King received the picture and studied it, he gained nirvana or the enlightenment, which is freedom from the round of rebirth. 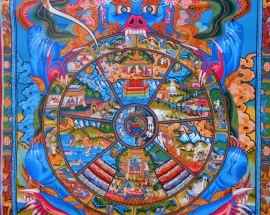 It is these three that set the whole wheel in motion and lead to both negative and positive human action. 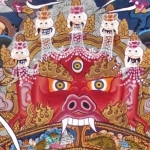 The hellish and heavenly destinies are indicated by the semi-circles of black and white immediately surrounding the three animals. 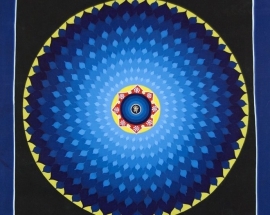 The full circle represents Karma, the universal law of cause and effect. 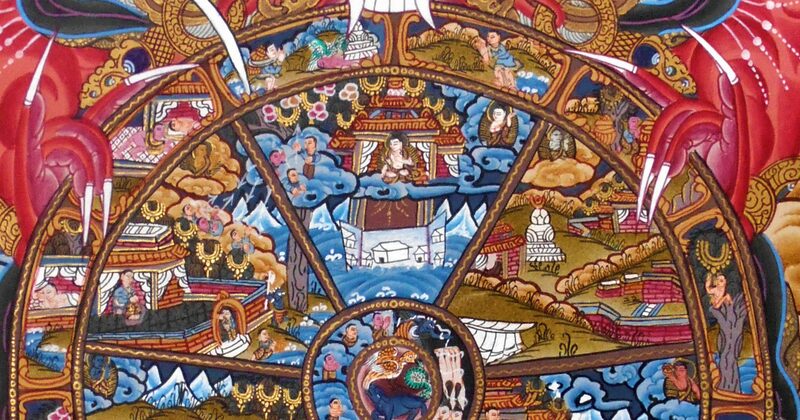 People on the dark path, through much disturbance, move down realms of existence while those on the bright path peacefully and smoothly keep moving up. 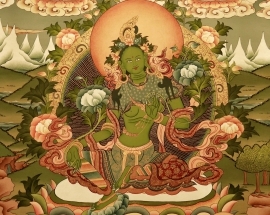 The first three are more pleasant but all six ultimately remain domains of suffering. 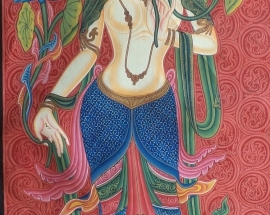 The gods, who in Buddhism are entities more powerful than human beings but undeserving of worship, are inclined to lives of pleasure and abundance. 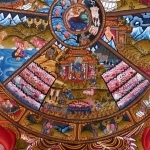 The fourth layer of the Bhavachakra contains the Twelve Nidanas or “twelve links” or “twelve-fold chain” that demonstrates just how the three poisons, through karma, resulting in the six realms of samsara. Here the conditionality and causality of cyclical existence are shown in detail. 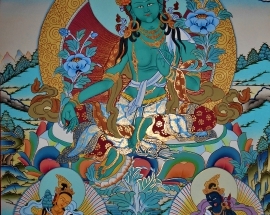 These interdependent phenomena shed light on karma. 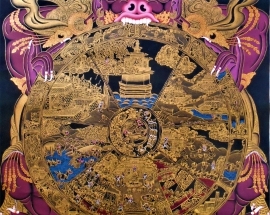 The four layers of the wheel are held by a huge, menacing figure. 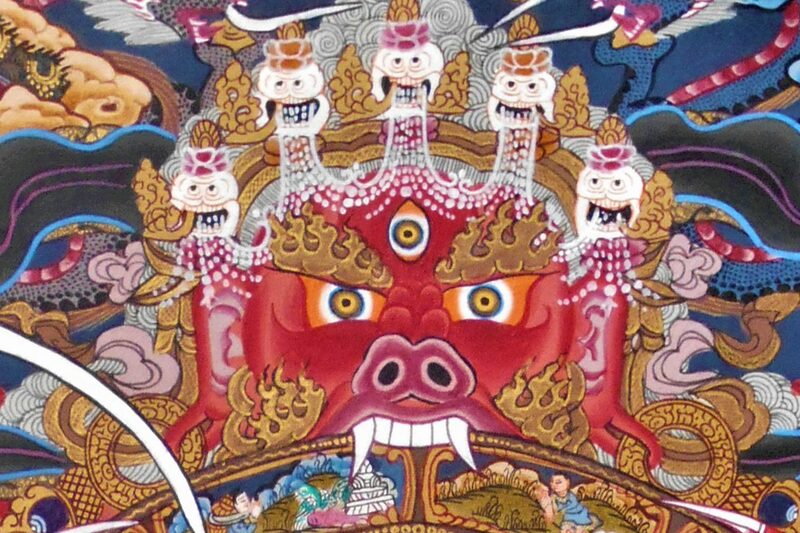 He is Yama, the lord of death, king of hell, god of the underworld, who symbolizes impermanence also known as Yamantaka. 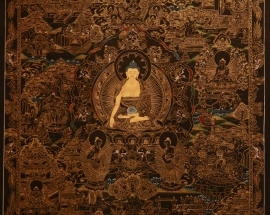 Beyond the wheel, the Buddha stands pointing to the moon, the path of liberation. 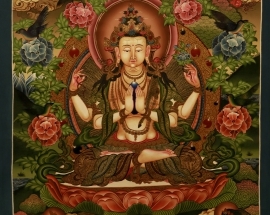 This can be called nirvana – the cessation of all unpleasant aches and pains.